Gene and Josie Whisnant sit at Gene’s desk in the House of Representatives. “I wouldn’t go down there without her,” he says. State Representative (and Colonel) Gene Whisnant and his wife, Josie,have lived a life worthy of a John le Carré novel. 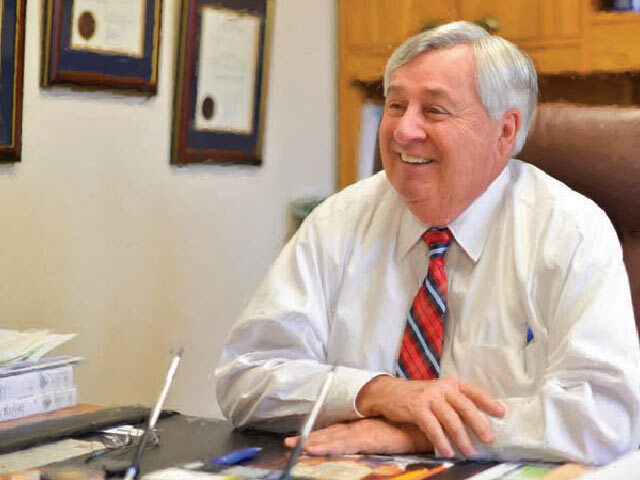 State Rep. Gene Whisnant (R-Sunriver), a decorated colonel and former diplomat, has had a long, distinguished career working in some of the most perilous work environments imaginable: the Pentagon; Da Nang, Vietnam; and war-torn Yugoslavia. For 31 years of this journey, Whisnant’s wife, Josie, has been his constant companion as he accepted assignments worthy of a spy novel. It is slightly ironic that a former military officer entrusted with many of the nation’s secrets now has a reputation for working on issues relating to transparency in government. 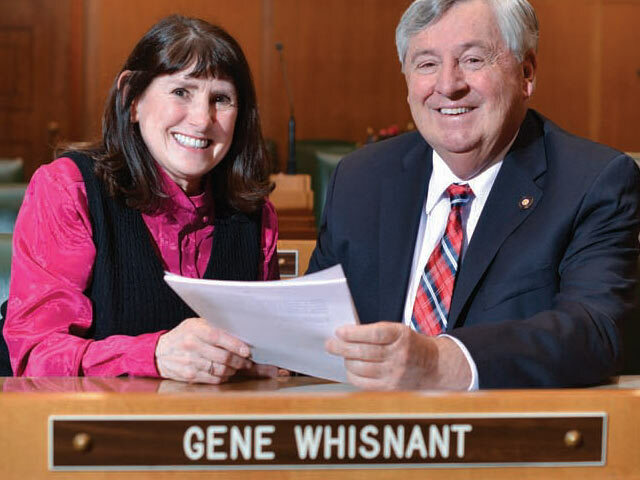 Whisnant helped establish the Oregon Transparency website, which is rated as one of the best in the nation. It helps Oregon citizens know what they are getting for their tax dollars. As a rural Republican in a legislature dominated by urban Democrats, Whisnant also has managed to get things done by working across the aisle, using humility and a deft touch honed by working with people in power. While the Oregon Legislature is not without sharp divisions, Whisnant has experienced work environments that are more cutthroat. For years, he worked in the Pentagon, where there are sharp elbows around every corner of its five sides, particularly among the Army, Navy, Air Force and Marines. But even among the service rivalries, Whisnant thrived because of his ability to focus on the mission. “I succeeded in the military because I learned to work with people and to work for a common goal,” he says. The ability to handle stressful situations comes easy to Whisnant, who flew on 32 missions as a combat camera officer in Vietnam for the Air Force. After various posts that included Germany and several Air Force bases in the U.S., Whisnant lost his first wife to cancer in 1983. He was introduced to Josie through her sister-in-law at the Pentagon, where he worked on President Ronald Reagan’s strategic defense initiative, also known as Star Wars. The couple married in 1986. Josie accompanied Whisnant as he accepted an attaché post in Yugoslavia, which entailed the collection of intelligence for the U.S. government. Together, he and Josie underwent what he calls “spy-training” in one of the most troubled spots in the world. By all measures, they were good at it. Whisnant’s unit was selected as the best intelligence collectors among defense attachés for their reporting of the Yugoslav War. Whisnant left the military in the early 1990s, and the couple moved to Sunriver to enjoy the amenities of Central Oregon. But they also quickly put down civic roots. They brought those same attributes to the legislature when Whisnant was first appointed in 2003. Now, Whisnant starts the 79th Legislative Assembly as vice chairman of the House Higher Education and Workforce Development Committee. He also serves on the important Joint Ways and Means Committee and the Education Subcommittee. Josie serves as gatekeeper and aide-de-camp for a demanding schedule that pivots among every conceivable issue in 15-minute increments. Josie also staffs her husband on the House floor during the long, lonely sessions of debates and roll call votes. Rep. Whisnant has focused on government transparency and accountability in state legislation. Whisnant became familiar with electric cooperatives while working at the Pentagon, where he was a member of Northern Virginia Electric Cooperative. He was pleased to learn when he moved to Oregon that Sunriver was served by La Pine-based Midstate Electric Cooperative. It may be hard to keep a smile in this Legislative Assembly. Whisnant is bracing for a tough session— perhaps the toughest he has ever faced. But he knows his partner will be on the ride with him—just another adventure on a series of adventures. Asked about the most interesting part of a life that has taken him into combat zones, high-level political intrigue and diplomatic espionage, Whisnant does not hesitate.